Location: The Philadelphia Zoo features prominently in E. B. White’s children’s novel, The Trumpet of the Swan. Located at the corner of West Girard Avenue and 34th Street, just to the west of the Schuykill River, the zoo is perhaps the oldest “true zoo” in the country. Opening just not long the Civil War (1874) and just in time to impress crowds to the Centennial celebration and world’s fair in Philadelphia (1876). Significance: Elwyn Brooks (E. B.) 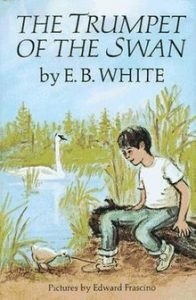 White was not born or raised in Philadelphia, but he set significant portions of one of his most popular children’s books, The Trumpet of the Swan (1970) in Philadelphia. In the novel, a young swam, Louis, who was born without a voice, learns to read, write, and play the trumpet to compensate for his lack of ability to communicate. His many adventures include befriending a young Montana boy, Sam Beaver, being a camp bugler, saving the life of a drowning child, and leading the swan boats in the Boston Public Garden. Eventually Louis’s adventures, and the financial need to pay off his father’s debt in acquiring his trumpet, lead him to Philadelphia. Here he takes up residence at Bird Lake at the Philadelphia Zoo and makes his fortune playing the trumpet in a Philadelphia jazz club. Eventually Louis and his mate return to Canada lake where he was born, but they visit Philadelphia every year with their young.